Hi lovelies, I hope you're all well? 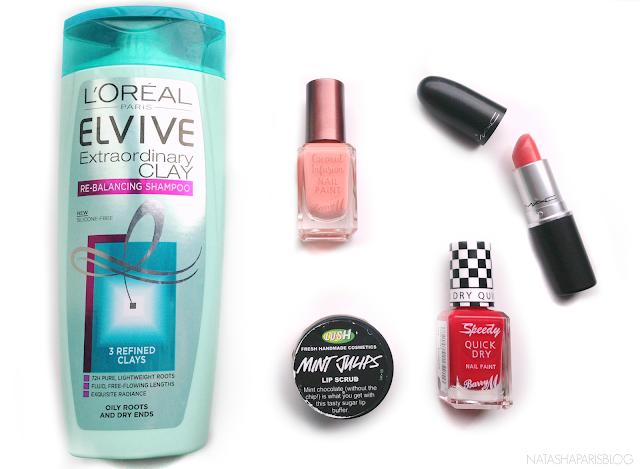 It's been a while since I shared a monthly beauty favourites post on my blog, so this post is a little bit overdue. Despite washing my hair regularly my roots can still become oily very quickly, whilst the ends of my hair can be left feeling a little bit dry (despite having had my haircut very recently). A couple of times a week I've been using L'Oreal Elvive Extraordinary Clay Re-Balancing Shampoo which has been helping to restore some balance, leaving my hair feeling lightweight and cleaner for longer. I'd like to try and purchase the L'Oreal Elvive Extraordinary Clay Masque at some point to use alongside this product to see if I get an even better result. When it comes to nail polish Barry M is my go-to brand for good quality at affordable prices. I recently purchased Barry M's Coconut Infusion Nail Paint in the shade 'Flamingo' - a lovely Spring/Summer shade which has an added blend of coconut water and coconut oil to help to hydrate and care for the nails whilst delivering a glossy, smooth finish. I've worn this shade a couple of times throughout the month, only alternating with Barry M's Speedy Quick Dry Nail Paint in the shade 'Dead Heat' - a stunning vibrant red shade which dries quickly, perfect when you're an impatient nail painter like me. Despite it being April I've still been suffering with dry skin and lips. In order to try and combat this I've been using body scrubs and mositurisers galore, including the LUSH Mint Julips Lip Scrub which I love. I reviewed this product in full back in 2014 - you can find my review here. As soon as I saw the sun making an appearance I reached straight for my brighter Spring/Summer lipsticks. My favourite shade at the moment is MAC Vegas Volt, which is a stunning coral shade which is just bright enough. You can see swatches of this shade in this blog post I wrote last year. I'd love to know what products you've been loving recently, feel free to let me know in the comments below.